It's easy to visit the Barnes. We're located at 20th and the Parkway in Philadelphia, with convenient access to parking, bike racks, and public transportation. View all our free programs. This one-hour tour is perfect for first-time visitors. Explore highlights of the collection and learn the history of the Barnes. Book online. Includes access to the collection and special exhibition before and after tour. This intimate 90-minute tour, led by a specially trained docent, takes place while the Barnes is closed to the public. Book online. Includes access to the collection and special exhibition, as well as a follow-up visit within two days. Each month, our one-hour Spotlight Tours focus on a different artist or theme, allowing for a deeper dive into a specific area of the collection. Check What's On to find out about our current tour. Our 45-minute Stroller Tours make visiting the Barnes galleries less stressful for families with very young children. Open to parents and caregivers with babies up to 18 months in a stroller or baby wrap. Book online. A private one-hour tour for you and up to five guests during regular hours. Explore the Barnes with a specially trained docent who will shape the tour around a subject of your choice, such as highlights of the collection or a favorite artist like Matisse, Renoir, Cézanne, or Rousseau. Request tours at least one week in advance; email us or call 215.278.7035. Maximum: 6. Includes post-tour collection access. Easy bus drop-off and pickup along Pennsylvania Ave.
For group reservations, email or call 215.278.7220. Tour at your own pace and explore the thousands of masterpieces in the Barnes collection. We are committed to providing the best possible experience for all our guests. What do I need to know about my visit? Philadelphia's renowned Constellation Culinary Group offers delicious fare at the Barnes, with a seasonal à la carte menu at the restaurant and small bites at the coffee bar. Members receive a 10% discount. With transitional glass walls, an open kitchen concept, and a lovely courtyard for alfresco dining, the Garden Restaurant is a perfect lunch or brunch destination. Our creatively sophisticated New American menu features French influences and only the freshest locally and seasonally sourced ingredients by Chef Anita Hirsch. All visitors are welcome—no Barnes admission is required. Located on the first floor. Reservations are encouraged; reserve online or call 215.278.7070. At our cozy coffee bar, experienced baristas serve Parliament Espresso & Coffee drinks—using perfectly pulled Arabica beans, organic milk and nondairy alternatives, and good-for-you sweeteners—as well as herbal and classic British and Indian teas, housemade pastries, and an assortment of other grab-and-go items. Located on the lower level. Open year-round, our café is a relaxing spot to enjoy small bites, including artisan pastries, petite sandwiches, and farm-stand salads, as well as Parliament coffee favorites. In the afternoon and evening, our knowledgeable servers offer a selection of wines by the glass. Located in the Annenberg Court or on the West Terrace in warm weather. The comfort and enjoyment of our guests is important to us, and we strive to accommodate your needs. Our entire facility is accessible to standard-size wheelchairs. Because of the small size of the collection galleries, some larger mobility devices may not be accommodated in all rooms. A limited number of standard wheelchairs are available free of charge. No reservation is necessary. Wheelchair-accessible restrooms are located on the Lower Level and in the Garden Restaurant. Designated parking is available for visitors with disabilities in our parking lot on Pennsylvania Avenue between 20th and 21st Streets. Vehicles must display a current state-issued disability placard or license plate. Parking is available on a first-come, first-served basis. Assistive listening devices amplify and clarify sound by cutting down or eliminating ambient noise. Headsets and T-coil loops are distributed free of charge on a first-come, first-served basis by request to a visitor services assistant. With advance notice, we are happy to provide sign language interpreters for lectures, workshops, special events, and reserved docent tours. Please make your request at least three weeks prior to your visit. Tickets must be purchased in advance. Email us for more information. Open or closed captioning is available for most of our film and video presentations. Trained service animals are welcome at the Barnes. No pets or other animals are permitted. Any paid Personal Care Attendant (PCA) accompanying a visitor with severe disabilities will be admitted free of charge. A request for free admission for a PCA should be made at the time the visitor with disabilities purchases their ticket. Visitors who wish to purchase advance tickets should email us or call 215.278.7200 to request a complimentary ticket for a paid PCA. To help make the Barnes accessible to all, we offer free admission to ACCESS/EBT cardholders, including those receiving Medical Assistance only. For more information, see Ways to Save on this page, under Prices. Bring your budding art lovers to the Barnes on the first Sunday of every month to experience hands-on activities, music, dance performances, and more. It's free! We also offer storytelling, art activities, and a range of family-friendly programs. We ask that everyone be respectful of one another, the artwork, and our facility as we work together to provide a welcoming environment. We require that all bags be inspected upon entrance to the museum. Backpacks, backpack-style child-carriers, oversize strollers, umbrellas, bulky coats, and bags and packages larger than 12 x 10 inches must be stowed in our free coat check or lockers on the Lower Level. We allow photography, unless otherwise posted. No flash, tripods, or selfie sticks. Notetaking and sketching with graphite pencil is permitted using notebooks no larger than 9 x 12 inches. If our galleries are crowded, we may ask you to stop sketching, writing, or taking photos. This helps us maintain movement throughout the space. Help us keep the collection safe by keeping your distance—stay about two feet from any wall. You can use the line on the floor as a helpful guide. Please don't touch paintings, frames, furniture, or ironwork. Food and drink are not allowed in the galleries. The Barnes is a smoke-free building. In certain circumstances, those who violate our guidelines may be asked to leave. 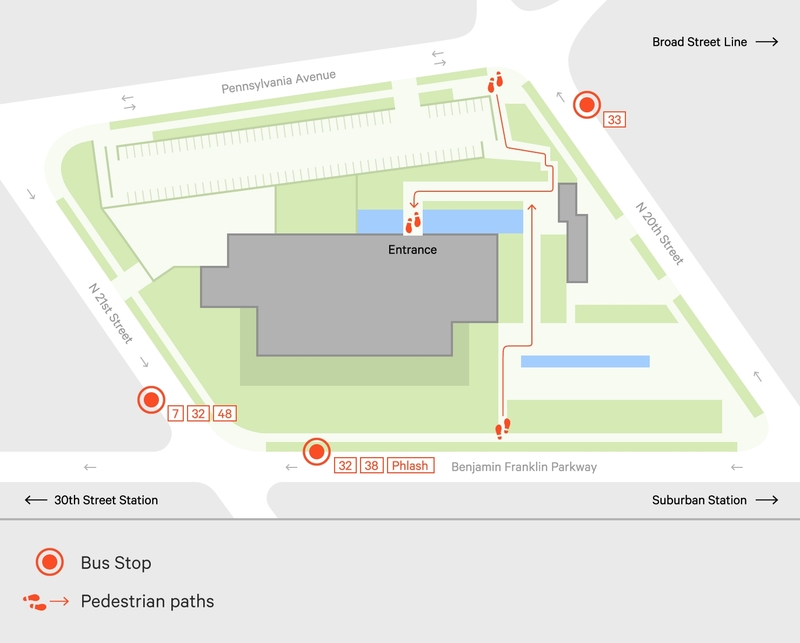 Located in the heart of Philadelphia, the Barnes is easily accessible by car, bike, or public transportation. We offer on-site parking—with charging stations—and bike racks for your convenience. How are you coming to the Barnes? The Barnes is located along the Benjamin Franklin Parkway, just off I-676. Get directions. Parking is on a first-come, first-served basis. Tickets can be validated in the lobby. Members must show a membership card to receive discounted rates. 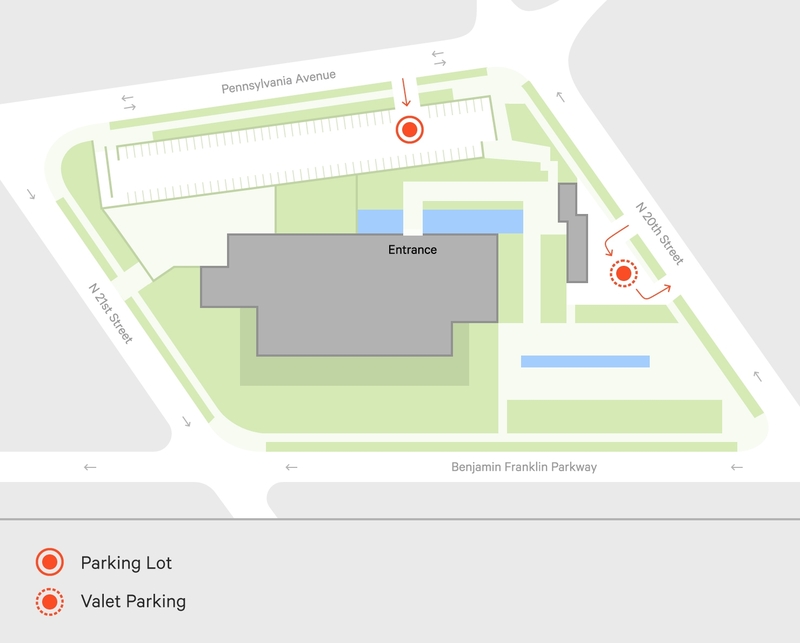 During operating hours, valet parking is available on 20th Street between the Parkway and Pennsylvania Avenue. The Barnes is within walking distance of several public transportation stops, including the SEPTA #7, #32, #33, #38, and #48 bus routes (and new #49 route). We're also Stop 7 on the Philly PHLASH, a quick and inexpensive shuttle service that stops at historic and cultural destinations throughout Center City. Service runs every 15 minutes between 10am and 6pm. Coming by bike? Our bike racks are located on Pennsylvania Avenue. 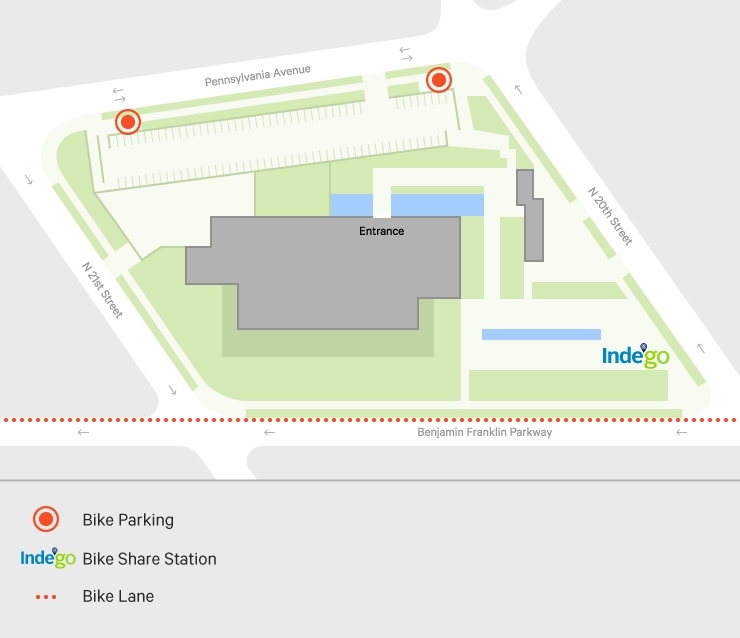 We're also home to an Indego bike share station, and Indego passholders get free admission and a discount for friends.